Hey LT, if you look under the wanted section you'll find a few options there. Grfishmaker was looking for a wiper motor & I answered him back under that section. I should of posted it under general discussion or the body section. It's a screwup on my part. Sorry!!! I have had good luck sourcing items like wiper parts from Cadel.com in Vancouver and Traction.com truck parts in most major cities. Cadel is the wholesale arm for Traction.You will find a link to AM Equipment which is a large OEM wiper supply company.The direct link to it is www.amequipment.com The wipe motors listed should interchange with the American Bosch bolt patterns.Once you have a part number any Traction store will bring in your product.They have a good selection of wiper arms as well. There is a pretty simple and complete wiper motor assembly available here. The motor assemble can be mounted quite aways from the windshield. I think I got this site off of The Old Trucker last year. This looks like it should do the job. He carries wiper blade and arms as well. Here's a site called jeepsandstuff.com that has stainless steel motors which includes wiper, arm & wire. Phone 1-877-664-9660. $ 43 bucks !! Here is the motor I was talking about eariler in the last post. That dealer is in Arizona. How ever Jemini Sales in Burnaby, BC. Phone 1-604-294-2623 has the same item. Here's a pic with info below. That's almost next door to you fellows in Sask. 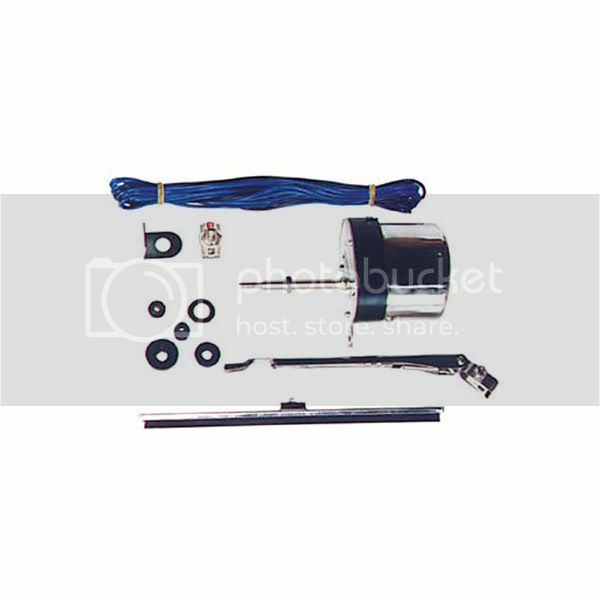 This is a Kit which includes an Electric Motor,Wiper Arm,and Wiper Blade.These would completely replace the Vacumn and cable systems on early CJ's and Willys Wagons and Pickups.PRICE IS PER SIDE.GENERALLY (2) TWO ARE REQUIRED AND WIRED TO A SWITCH ON THE DASH.12 VOLT Stainless Housing.